Exclusive on-line retailer Mr Porter and top end gym Equinox are collaborating to host a series of Q&A sessions celebrating cycling, fitness and style. During the first session which focused on cycling Edmund Bradbury of the UK based team Not For The Ordinary (NFTO) shared his insider knowledge. After Bradbury had shared his wisdom to the masses I sat down with him to find out a few of his secrets. 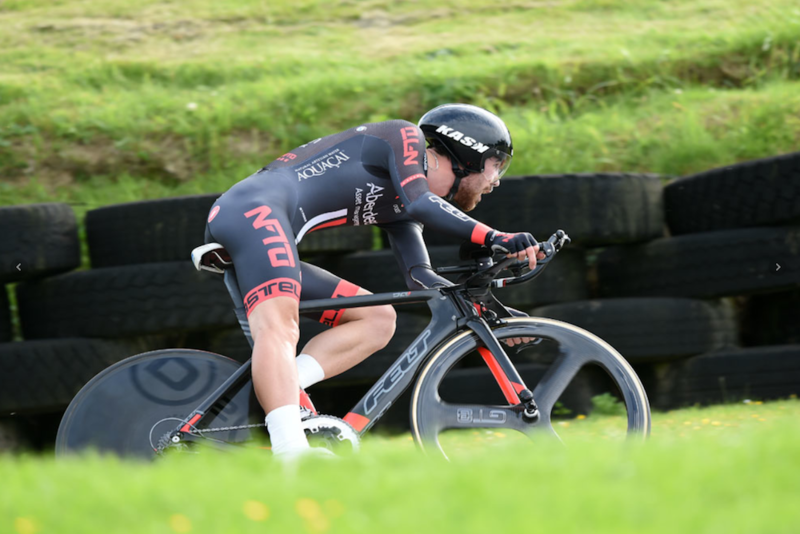 Bradbury has only been a full time cyclist for four months following the completion of his university studies but already he has amassed some impressive results, including second to Alex Dowsett in the British Time Trial Championships. The ‘trip strips’ are attached to the sides of your lower leg. If you’ve been paying close attention to the domestic time trialling scene you may have noticed the rise in testers using Aero Trip Strips (ATS). Xavier Disley of Aerocoach, the manufacturer of ATS, previously informed us that correctly positioned trip strips could save a rider towards five watts which equates to around seven or eight seconds over a 10-mile time trial. The concept is that by attaching the strips at 45 degrees either side of the shin, they make the surface of your calves slip through the air more efficiently. This is done by converting air that hits your lower leg from laminar into a turbulent flow earlier, thereby encouraging the air to cling to the leg longer before separating. In short, it means the ATS are designed to reduce drag and save you watts. At present it’s recommended that you attach the strips to your leg at home before a race. However, some companies, such as British company Nopinz, are now developing calf guards with integrated trip strips which could make the strips easier to position. On the basis that the ATS provide these advantages, it is likely they will only become more and more prevalent in domestic time trials. This is where it gets interesting. Whereas ATS are permitted by the CTT they are not allowed by the UCI – i.e. they cannot be used at the governing body’s sanctioned events. Bradbury explained that to get around this he has experimented, and he has seen other riders doing the same, with leaving a line of hair on his legs to see if they can legitimately mirror the same results as the ATS. 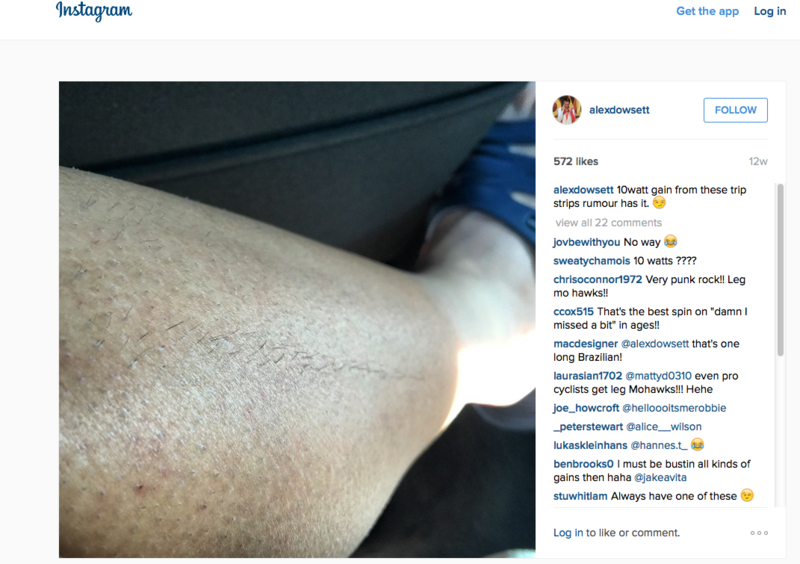 In fact, Alex Dowsett posted a picture on Instragram on 11 May 2015 referring to the potential gains. Alex Dowsett’s Instagram post alluding to potential aero advantages of a line of hair. Bradbury could not confirm whether or not he had found any quantifiable benefits. Aerocoach’s Disley confirmed he has not tested whether a strip of hair could mirror the performance of the ATS, but accepted it might be possible with the caveat that for the strips to be successful, they need to be a specific length and chevron shaped which would make it difficult to replicate. This means any savings are likely to only be marginal. Despite each ATS strip working out less than £1, you might find some cost conscious domestic racers matching their pro counterparts by turning up with distinctive vertical lines of hair on their lower legs in an attempt to save some vital watts. If the line of hair works it will be interesting to see how the UCI will respond, if at all. A good fitting skin suit is fundamental, especially when your body accounts for around 80% of your overall drag and your bike the remaining 20%. It is amazing how much money people spend on aero wheels but will have an ill fitting skin suit. Beyond having a good fitting suit, there are suits that seek to make further aerodynamic advantages. In fact, incorporating ‘trip strip’ technology into clothing is not new – the GB riders at London 2012 used similar technology and several WorldTour teams have riders wearing ‘pinstripe’ skin suits. Bradbury confirmed that his team issue Castelli Body Paint 3.0 Speed Suit LS incorporates similar ‘trip strip’ technology into the arm seams with the intention of again saving watts. Unfortunately going fast isn’t just about wearing the most aerodynamic clothing and accessories, you actually have to ride quickly on your chosen steed. Edmund’s Felt DA4 TT bike with a 53t chainring, Dura Ace mechanical with levers hacksawed down to fit inside the UCI length rule, Enve smart TT bars, Adamo Racing II saddle and speed play pedals. As a time trial specialist Bradbury spends around 40% of his training on his TT specific bike. It is surprising how many riders spend all their time training on their road bikes and are then perplexed that they are inefficient on their TT bike. Bradbury explained that when he first switches back to his TT bike after a winter on his cross bike he loses around 90 watts. It then takes a substantial amount of time on his TT bike to start clawing back the deficit. However, Bradbury was quick to point out that when time trialling, it isn’t just about power. There are many other factors, but one of particular note is your Coefficient of Drag Area (CDA). CDA is measured in m2 and the lower the number the more aerodynamic you are. The reality is that it is often a trade off, an extreme aerodynamic position will provide a low CDA but you may lose a substantial amount of power. The trick is to find the fastest position that you can sustain for the duration of your race, maintaining the best combination of power and CDA. In summary, there are many things to work on and consider if you want to go faster, some costing more in time and money than others. Without question, the most bizarre must be having your legs shaven save for some thin vertical stripes. How to be more aero on your road bike?